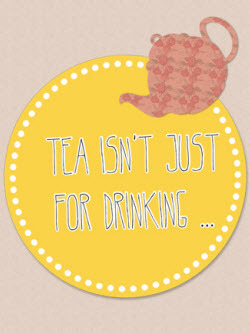 Tea’s Not Just for Drinking! You may have several cups a day, but have you considered that you could be doing more with your tea? The leaves in your mug aren’t just for drinking and there are countless different ways you could be using them. I’m always keen to promote getting the most use out of something, so before you sling your tea bag or tea leaves into the waste disposal, think about trying out some of these ideas. A day spent in the office staring intensely at your screen can leave your eyes looking tired, red, and puffy, but placing your used teabag onto your eyes can help make them feel refreshed. You can use black or green tea, and it can be either warm or cold and applied for at least 10 minutes. Are you green fingered? You can even use your tea leaves to fertilise the soil around your plants, as shown in this article on this blog. The worms will enjoy chomping their way through your leftovers! Another way is to put your used teabags onto your compost heap, safe in the knowledge that your cuppa tea is helping the circle of life continue! Some of my fellow contributors on The English Tea Store Tea Blog have featured some very tasty recipes for cooking with tea. You can find some tea-spiration here. I also love cooking with tea, and it’s my secret ingredient when I make my legendary beef stew. I add a cup of strongly brewed tea after I’ve browned off the meat. This helps to make it as tender as possible. If you like smoking your own food, next time you do think about adding some tea leaves for a really unique taste. For example, smoking with Earl Grey leaves will enhance the flavour of your cheese, meat, and fish. It’s amazing what you can do with tea and tea art shows you that there are endless creative possibilities. An aged or vintage look is simple to create when using tea as a dye or stain and it can be done on a variety of materials including paper and felt. Painting and tie dyeing with tea are popular practices and there are many tutorials available online to walk you through the basics. I hope that whilst you are enjoying a cup of tea, you’ll give a thought to how else your leaves could be used. Don’t just chuck them – you can most definitely find another use for them.